'Destiny Learning', a path of adult education conceived and developed by Coenraad van Houten (based on the work of Rudolf Steiner), is here expanded to show a threefold way of working with karma: understanding, transforming and ordering. This threefold approach opens new vistas for healing relationships and conflicts, for developing creative faculties for community building, and for taking initiatives based on freedom. The author widens and deepens his previous work on the theme, showing that learning from destiny, as well as awakening the forces of will, are ongoing processes. He offers practical advice that is directly applicable to everyday life. Although this book can be studied on its own, it is also a development and completion of themes from van Houten's earlier works, Practising Destiny and Awakening the Will. 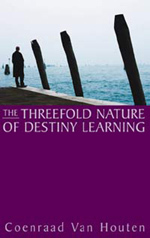 Crucial aspects of the threefold path of 'destiny learning' are here discussed and explained in greater detail. Anyone seeking to take their personal development in hand will find many nuggets of spiritual wisdom, based on a lifetime's work, in this short book. COENRAAD VAN HOUTEN was born in the Netherlands in 1922. After studying Chemistry, Economics and 'Social Pedagogy', he lived and worked in Holland, Indonesia, Hong Kong and Britain as a manager in business, as a consultant, and as the director of the Centre for Social Development (which he co-founded). He has developed specialist programmes and seminars for educating adults, and presently advises organizations on training programmes. He is the author of Awakening the Will, Practising Destiny, and the co-founder of the New Adult Learning Movement.